Before going any further, let me state for the record that I expect that we will, in due course, find out who were the perpetrators of the murderous fire-bombing attack on a family in the Arab village of Duma. I am almost completely convinced that, as the Shin Bet has indicated, the perpetrators will turn out to be young Jewish settlers inflamed with a Messianic belief in the need to take over all of historic Israel. The probability is extremely high that that is the case. Even if not, Israel has been alerted to the danger that Jewish terrorists represent, and has taken swift action to start dismantling their organizations and placing leaders in administrative detention. However, what we saw in the Guardian was a typical outburst of articles that upon examination appear to have included no serious investigative efforts on behalf of their journalists and editors to establish in detail what actually happened. Reminiscent of the Guardian’s endless reporting on, for example, the Al Durrah affair (Israel likely not to blame after a lengthy investigation), the infamous “Jenin Massacre” (never happened), the Mavi Marmara flotilla (Israel exonerated by the UN’s Palmer report), we saw 12 articles, photos-of-the-week” and editorials at the Guardian on the terror attack in Duma. This attack may finally be the exception, but the Guardian’s track record on authoritative reporting about events in Gaza and the West Bank is so poor and the superficiality of their reporting about this attack is so glaring that it gives me pause. First some background on their sources, which are so lightweight and biased that they raise questions about the quality and depth of what was presented to the Guardian’s readers about this tragedy. The Guardian’s reporting on the tragedy was kicked off by Kate Shuttleworth, a New Zealand freelancer spending time in Jerusalem whose bio modestly reveals that she “is a skilled newspaper reporter, who has written, reported and produced for broadcast media in New Zealand and internationally.” Apparently bored with reporting “in the remote Northland region [of New Zealand] covering general news for the Northern Advocate, Northland Age and the Herald on Sunday”, like so many before who know nothing about Israel or the Palestinians she headed towards a more interesting location – Jerusalem. Her reportage covers Palestinian affairs, heavily favoring the Arab viewpoint and ignoring the attacks on Israelis and the more nuanced aspects of the I/P conflict. One wonders what credentials she can possibly bring with her from New Zealand. Does she speak either Hebrew or Arabic? Or does she naively transcribe what her PR-astute fixer(s) tell her, like so many before her? Her report from Duma was co-authored with Mairav Zonszein, the Guardian’s latest incarnation of former Guardian flame-outs such as Seth Freedman, Rachel Shabi and Mya Guarnieri – young Jews who wrote from Israel with an anti-Israeli chip on their shoulder. Their bios read like Xeroxed copies of the same resume – “wrote for +972, Al Jazeera, Forward, The New York Times, and the Guardian” – any anti-Israeli media outlet looking for a Jew willing to condemn Israel in writing. It is not clear that Zonszein was ever in Duma, so her articles may only be transcriptions of articles for Israeli newspapers. Oddly, her next effort, Father of Palestinian toddler killed in West Bank Arson attack Dies leads with Jamie Grierson’s name. Grierson “is a breaking news reporter at the Guardian”. Elder of Ziyon took a hard look at Zonszein’s record of bias here in 2014. Notably absent were any articles by the Guardian’s Jerusalem correspondent, Peter Beaumont – perhaps taking a vacation from the rigors of constantly attacking Israel from the bar at the American Colony. But from London Jonathan Freedland weighed in– how could he have had any more insight into the events in Duma than any of his readers? Was his article merely click-bait to bring out the anti-Israeli faithful? To round things out, an article by Harriet Sherwood appeared – from a reporter about whom it can truly be said that she came to Israel knowing nothing about the country, and left knowing even less. In contrast to the generally accepted reports on events in Duma, Arutz Sheva, a religious channel and news site based in Israel, printed a report by a young settler, Yonadav Tapuchi, who visited Duma to try to pay his condolences and respect to the family and village. “Throughout the trip we heard explanations in Arabic, most of which were translated. We heard their story of the incident. It was impossible to ignore some of the more curious aspects of the story. I would start with the fact that the two houses (I had always thought only one house was burnt) are located in the center of the village, and that in order to get there we had to travel a number of minutes from the entrance. Duma is spread out over a gigantic area, and the houses are situated at the end of a winding road, among fences and yards. “According to the Duma version, the attackers burnt one house, and then saw that it was empty, and so they went to set fire to the next house. The second house is enclosed by a fence, and the windows are covered by a dense lattice; a firebomb cannot be hurled through the windows, and in any event it is very hard to reach the windows behind the fence. The arsonists had to go around the house, enter the yard, and place the firebombs through the lattice. 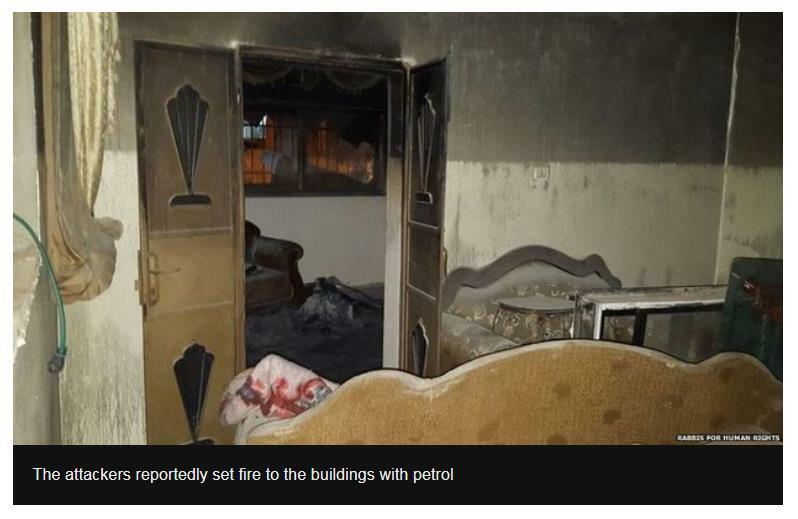 According to the Duma version, the attackers entered the house, stood over the parents and did not let them leave until the flames engulfed the house. Only then did the arsonists run away from the village. Arutz Sheva has also reported that IDF forces have confiscated surveillance cameras from the Arab village of Duma. Since the Guardian appears to have spent more words on this attack than any other media outlet, I wonder if they would provide answers, or send someone to get answers, to some of the questions that have arisen with regard to the attack. 1) Where in Duma are the houses that were attacked? This is important. If the houses were at the edge of the village, an attack by outsiders would be feasible. If they are at the center of the village, as Tapuchi reported, it would seem to be very difficult to infiltrate such a large place without being discovered and escape without being captured. b. A look at a satellite view of Duma (e.g., on Google Earth) corroborates Tapuchi’s report that it is a very large village. Tapuchi reported that the houses are well inside Duma. If he is correct it seems clear that Al Jazeera and others never actually visited the houses in Duma. 2) How did the attackers throw a firebomb through a latticed window? b. Of course the firebomb could have shattered against the lattice and set the room on fire. Yet there is no mention in the major media of this obstacle, or the fence that Tapuchi reports that would have made it more difficult to set the house on fire. 3) What was really written on the walls of the houses by the perpetrators and what did the Guardian’s reporter believe was written there? a. In her first report, with Mairav Zonszein (perhaps providing Shuttleworth with a translation) Shuttleworth wrote from Duma: “Graffiti saying “revenge” and “long live the messiah” and “price tag” was found on the home”. d. Ha’aretz reported: According to witnesses, at roughly 4 A.M. Friday morning, two masked men arrived at two homes in the village of Douma, not far from the settlement of Migdalim. 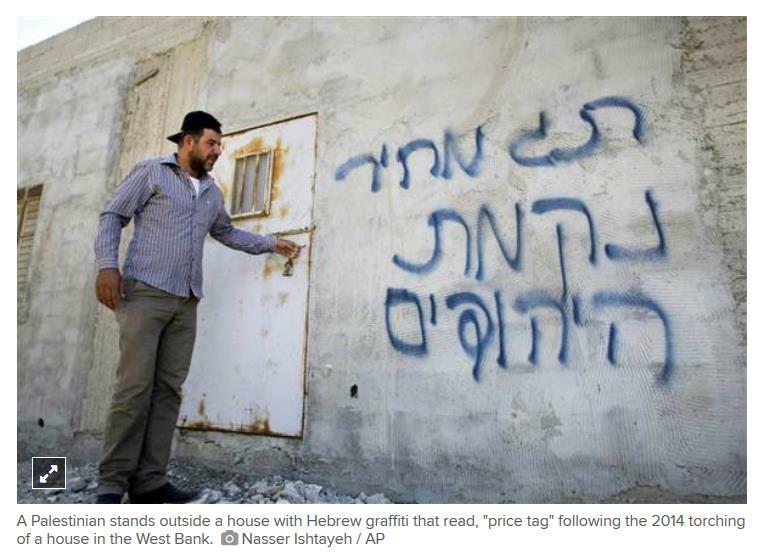 They sprayed painted graffiti reading “revenge” and “long live the Messiah” in Hebrew, breaking the windows of the homes and throwing two firebombs inside. Again, no mention of the words “price tag”. e. I searched for photographs of the inscriptions on the walls of the houses in Duma. I cannot find one in which the words “tag mechir” (in Hebrew) appear. Does this suggest that perhaps the perpetrators were not, in fact, Jewish settlers, but some person or persons wishing to give the impression that the attackers were settlers? Quite possibly, Shuttleworth does not read or speak Hebrew, and was simply told, or led to believe, that these words were inscribed on the wall. 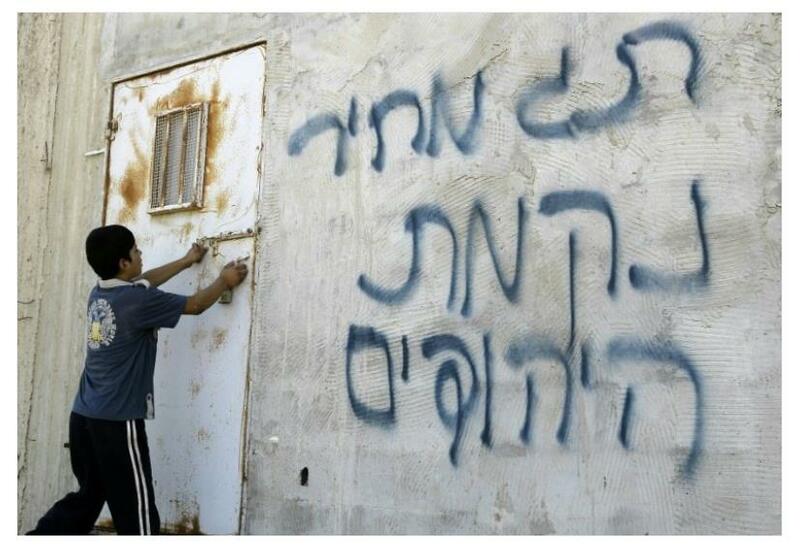 If the words “tag mechir” were not present – who really wrote those words on the wall of the house? f. As an example of a price tag inscription, NBC provided this explanation, together with a photograph. However, the photograph showing the words “tag mechir” in Hebrew is from 2014, not from this attack and is an example of how easily lax editing or Palestinian PR efforts can create an impression that is, in fact, totally false. 4) The West Bank is covered with people who own cameras and video cameras. We are presented almost on a daily basis with pictures and videos from the West Bank every time an incident occurs. Was the shock of this attack so great that in this village no-one managed to pick up a camera and photograph the assailants? Even though it was the middle of the night, was it likely that this serious event went unrecorded? Some residents reported being awake at the time. In fact, there may be photographic evidence of the attack. Arutz Sheva reported: “Palestinian Arab media reported on Monday night that IDF forces have confiscated surveillance cameras from the Arab village of Duma in Samaria, as part of the investigation into last Friday’s lethal arson that left an infant dead and four family members wounded. The pro-Hamas Al-Aqsa TV claimed that the forces seized a large number of cameras in the village, located near Shechem (Nablus)”. 5) How many attackers were actually involved and where were they from? Can we be sure they were settlers? a. Ha’aretz first reported two attackers, apparently from Migdalim: “According to witnesses, at roughly 4 A.M. Friday morning, two masked men arrived at two homes in the village of Douma, not far from the settlement of Migdalim. They sprayed painted graffiti reading “revenge” and “long live the Messiah” in Hebrew, breaking the windows of the homes and throwing two firebombs inside”. b. However, a few lines later, Ha’aretz cited this resident: “Local resident Mesalem Daoubasah, 23, said he saw four settlers fleeing the scene, with several local residents following in pursuit. According to Daoubasah, the settlers fled toward the settlement of Ma’aleh Ephraim”. In summary, there is sufficient confusion to suggest that 11 or 12 articles in the Guardian may not fully or correctly represent what happened that awful night at Duma even if the major conclusion, that the attackers were Jewish terrorists, proves to be correct. The majority of the Guardian’s articles are based on the initial two articles by a free-lancer, apparently standing in for Peter Beaumont. Given the coordination with Zonszein it seems likely she needs someone to translate the Hebrew inscriptions on the walls of the fire-bombed buildings in Duma and quite possibly does not speak Arabic. What else did she hear, or even not hear, and what biases did she bring into her recitation of the events? The Guardian’s heavy-handed reporting on this affair has all the hallmarks of its previous disastrous efforts on major events involving Israel and the West Bank and Gaza. The Guardian has blamed Israel for everything imaginable: petty stories, such as Harriet Sherwood’s risible ‘cruelty to chickens’ “expose“, to larger lead stories such as Chris McGreal’s’ extremely misleading reports on Israel’s alleged nuclear deals with South Africa. Their reporting simply can’t be taken at face-value. Still, as the saying goes, even a stopped clock shows the time correctly twice a day – given the reports from Israel, this may be the one case in which the Guardian is broadly correct, even though some of the details may turn out to be wrong. We will have to wait to see what Israel’s security forces find out. According to reports the graffiti was painted AFTER the second house was burnt. So not only did those two houses take 20 minutes to get to inside the village, they waited around and marked the house afterward. If you believe this entire episode has been honestly reported in the media, then I have a bridge for sale. Nazi leftwing and arabs do not give a damn for truth they only want to fight against Israel thru pr and the reason they have some success is that the european leftwing media DO THEIR JOB. When this kind of tre”atment is given other religions THEY REACT AND BLOW UP THE MEDIAS’ OFFICES AND THE MATTER IS ENDED. With the stupid attitude of jews who do not want to react with violence the matter never ends and keeps swelling. The Israeli method is responsible for the MESS.